Dear Friends of Carmel, “Your time of Lenten training is over!” – what Christian heart does not soar at the sound of these words, said by the priest just before we renew our baptismal vows at the Easter Vigil, and just before the Mass begins. We have followed Our Lord to Calvary and are waiting to rise with Him. Holy Week here at Carmel is a taxing week. 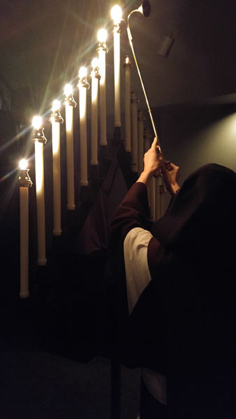 Tenebrae, the extra preparations for the altar, linens to be washed and pressed, lilies to be prepared, chants to be practiced… The long liturgical ceremonies leave us, at the end of it, exhausted and exultant. As one of our priests so aptly said, our life is Holy Week. We re-live and taste the extraordinary mysteries of our Redemption. It is, perhaps, the closest thing to Heaven on this earth when we plunge into it and become a part of all the graces it contains. We will be brief in this message, since we all need a little time for rest. But we want to wish you a Blessed and peaceful Easter! We have only begun to celebrate! The Paschal candle will be with us for forty days, reminding us of Our Lord’s presence – and the important lessons He gave His dear ones before leaving this earth. How greatly we need these reminders in such dark and troubled days! May the Holy Virgin Mother, whose heart rejoiced more than all others at the victory of Our Savior, be near to us all during this Paschal Season. A few pictures from the past few weeks…. Holy Week is a week of retreat for us. 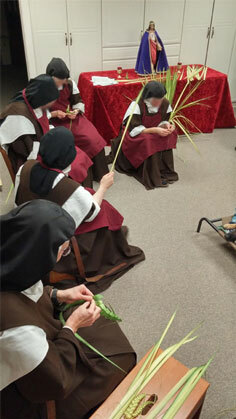 On Palm Sunday we meet for our last recreation in order to braid palms. Lighting the candles for Tenebrae, the morning Divine Office on the three days of the Sacred Triduum. At the end of Lauds, the “Christ candle” is the only candle still lit. It is removed from Choir while the solemn “Christus est factus nobis” is chanted (Christ became obedient unto death…), followed by an “earthquake” (knocking/banging on choir benches) before it is solemnly brought back in and placed at the top of the candle stand once again. This moving and symbolic ceremony is a beautiful reminder of the Resurrection, which we are anticipating. 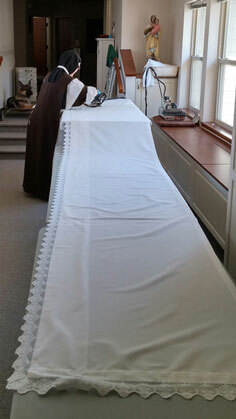 There is always a great deal of ironing to do during the first days of Holy Week. 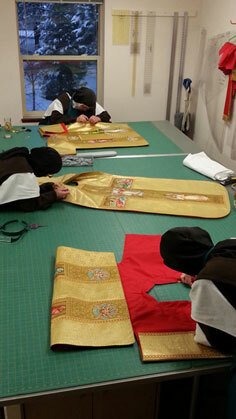 And pressing the altar cloth for the main altar takes up a good deal of space in the cloister! 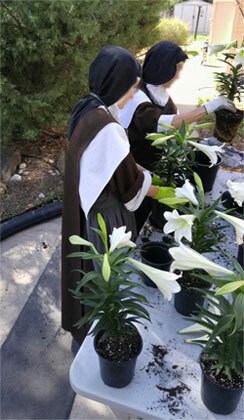 The Easter lilies arrive on Spy Wednesday so that we may prepare them for the altar. Some of them arrived a little “beat up” this year, so we had to do some replanting. 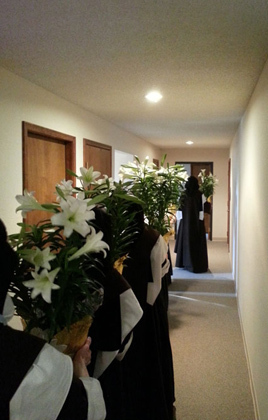 “The Procession of the lilies” – No, this is not a Liturgical ceremony, but it is the easiest way to move 18 lily plants from the recreation room to the Sacristy in the shortest amount of time, early on Holy Saturday morning. We had a few good snow storms before Easter.